Durgan Travel Service features all- or mostly-inclusive European vacations at super low group rates. Our European tour programs are available from almost every major airport throughout the country on a domestic carrier feeding into an international flight from the East Coast. Additionally, we have a full schedule of domestic and worldwide tours for your consideration. We can also arrange individual travel for independent touring throughout Europe, North America or the rest of the world! Durgan Travel Service has been serving the Group Travel Community for nearly 50 years, originally as the Durgan Group at Crimson Travel Service in October of 1969. Crimson Travel, New England’s largest tour company, morphed into Thomas Cook Travel, North America Division. We maintained our affiliation with Thomas Cook until American Express bought them in 1994. In March of 1995, we spun off our operation from American Express/Thomas Cook and opened our office in Stoneham, Massachusetts as Durgan Travel Service. We are a full-service travel agency and tour operator, and can provide excellent rates on all domestic and international cruise lines, as well. Our rapid growth however, is due to the incredibly priced European tours that we have developed over the last two-plus decades. Our tour volume is such that we are a top producer for the Boston gateway for Alitalia, Swiss Airlines, British Airways and Air France, and our rates with them reflect this status. Durgan Travel Service won the “Lo Leonardo Internazionale Award” from the Italian Government for our contribution with travel to Italy. We also received the "Golden Wings" Award from Alitalia Airlines in appreciation of the high amount of business we are producing with Alitalia, and in recognition of the quality of our tour operation. We are also members of the National Tour Association, and are required to carry a minimum $1,000,000 in Errors and Omissions Insurance. Additionally, we belong to CLIA (Cruise Lines International). We are also a founding member of Travel Alliance Partners, a nationwide network of tour operators which provides us with access to hundreds of additional high-quality itineraries, and fantastic discounts on a variety of tours. We look forward to the opportunity to be of service to you, and assure you our best efforts on your behalf. Please provide your e-mail address to us at info@durgantravel.com, so that we can add you to our e-mail list for weekly travel updates. If you are connected to a travel group that doesn’t currently work with Durgan Travel, please put them in contact with us so that we might develop a relationship with them. On the other hand, we do have a group leader program for those who would like to start their own group from their friends, family, co-workers, and anyone else they might meet. Contact a member of our sales department for more information. "Our mission is to create and provide the most enjoyable and memorable travel experience for our clients. We ensure outstanding service, value, quality, product, and price." Durgan Travel Service is a recipient of the prestigious Golden Wings Award. This award recognizes Durgan Travel Service as a major contributor to the success of Alitalia Airlines. Only a select few travel agencies have been chosen as recipients of this award. The presentation was made at a ceremony and dinner, hosted by Alitalia Airlines, in New York City. "Receiving this award was remarkable," said General Manager Matt Lordan. "Basically, it was a collection of the major players in the international travel market, and Durgan Travel was right up there among them. We've come a long way very quickly!" Alitalia has been a key partner in Durgan Travel Service's rise to prominence in the international travel market. Durgan Travel Service had predominantly been a domestic travel service provider before partnering with Alitalia in promoting trips to Italy, and Durgan Travel is now recognized in the industry as one of North America's largest tour operators to Italy! In conjunction with Alitalia, Durgan Travel Service has been able to expand on its original base of trips to the Sicilian destinations of Agrigento and Taormina with many popular mainland-Italy tours such as Sorrento, Tuscany, Assisi, the Italian Riviera and the Northern Lakes Region. Especially successful for Durgan Travel Service has been its combination tour to Rome, Florence and Venice. 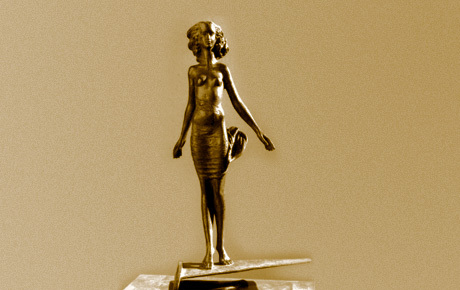 Recipients of the Golden Wings Award receive a limited edition bronze statue (pictured above) by noted Italian sculptor Vito Pancella, who was in attendance at the presentation ceremony. 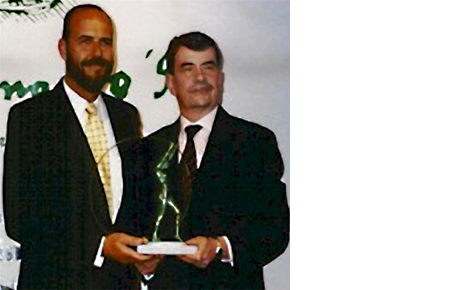 In a ceremony held in Catania, Sicily, Richard Durgan, President of Durgan Travel Service, was presented the lo Leonardo Internazionale Award by Vice-President for Alitalia International Passenger Sales, Niels-Henrik Wulff. This prestigious prize was awarded to the top tour operators in Italy who have promoted tourism to Italy (and in particular - Sicily) in conjunction with Alitalia Airlines and the Tourist Board of the Province of Catania. For one year, international recipients were chosen and Durgan Travel was one of only thirteen so honored worldwide. In part, Durgan Travel was singled out "in recognition and appreciation for its outstanding effort in promoting Sicily". Recipients of the lo Leonardo Internazionale received a limited edition bronze statue by noted Italian sculptor Giorgio Fanara and a commemorative plaque. Durgan Travel is an award-winning travel agency with a half century of experience in travel planning. We specialize in group tours with a focus on Europe, but our capabilities span the entire globe and we have a stellar staff of agents ready to assist with any of your travel needs, including individual travel and cruises.